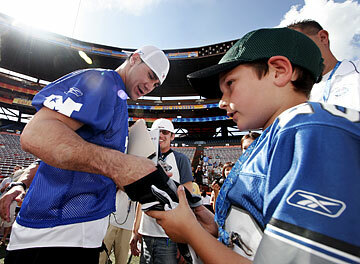 Pro Bowl Ohana Day offered a sneak peek of the 2006 Pro Bowl with AFC and NFC All-Star teams practicing. The Seattle Seahawk's Lofa Tatupu gave his gloves to Leo Blavin, 10, after practice. If someone offers to sell you a hot ticket to the National Football League's exclusive Pro Bowl tailgate party at Richardson Field today, beware -- it may be stolen. NFL officials told police that 159 tickets to today's tailgate event and 280 tickets to a VIP party Friday night disappeared from a room at the Hilton Hawaiian Village sometime between Sunday night and Tuesday morning, said Waikiki Police Sgt. Travis Kohatsu. The total value of the missing tickets was given as $79,000, he said. Honolulu Police will be assisting NFL officials to checking the numbers on each of the $185 tickets for the "Magic of the Sea" event to see if any of the stolen tickets turn up, NFL spokesman Brian McCarthy said yesterday. "We did report to police that a number of tailgate party tickets found their way into illegitimate hands," McCarthy said. He said officials will work with anyone holding the stolen tickets to find out where they got them. After practice, quarterbacks Matt Hasselbeck (from the Seattle Seahawks) and Jake Delhomme (from the Carolina Panthers) threw some passes to some of the guests on the field. 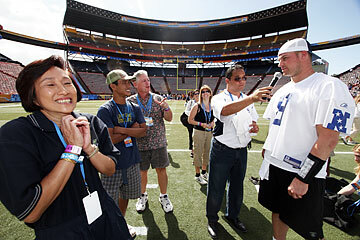 Above, Connie Lau, left, was excited about running a pass route and catching a pass from Hasselbeck. Her son, Greg, and husband, Russell, barely missed catching theirs. Police and NFL officials wouldn't say yesterday whether anyone attempted to use any of the missing tickets at the Friday night party at the Aloha Tower Marketplace. NFL officials told police that the tickets had been in a box in a room on the 19th floor of the Tapa Tower, Kohatsu said. The NFL has rented the entire floor and requires security clearance to enter, he said. The NFL issued 5,000 tickets to the Richardson Field tailgate party, which starts at 11:30 today and features food, beverages and music, McCarthy said. According to the bestplaceshawaii.com Web site, the party will feature food from premiere restaurants, a hosted bar and appearances by NFL players, cheerleaders and team mascots. "The event offers an up-close and personal chance to hang with celebrities, NFL business partners and local dignitaries," the site says under its tips for attending the Pro Bowl. 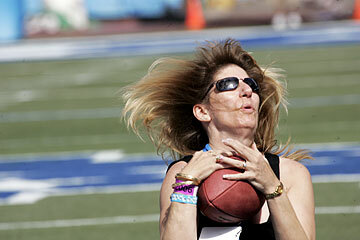 Terry O'Reilley gave it her all as she caught a Hasselbeck pass.